Note: Some images of this webpage may be enlarged. To close an enlarged image, please click outside of it. Country of art and tradition, Morocco is rich in culture and diversity. Longer subjected to many external influences, Morocco has often fostered by successive different people who settled there. Berber people were among the first inhabitants of Morocco, but their history is not well known. They rubbed Phoenicians and Carthaginians in previous centuries A.D. Later, the Romans will greatly contribut to the development of Arts and Letters in Morocco. The city of Volubilis (Walili or Oualili in berber language), situated near the city of Meknès, on the banks of the Oued Khoumane, is a perfect illustration of this influence. 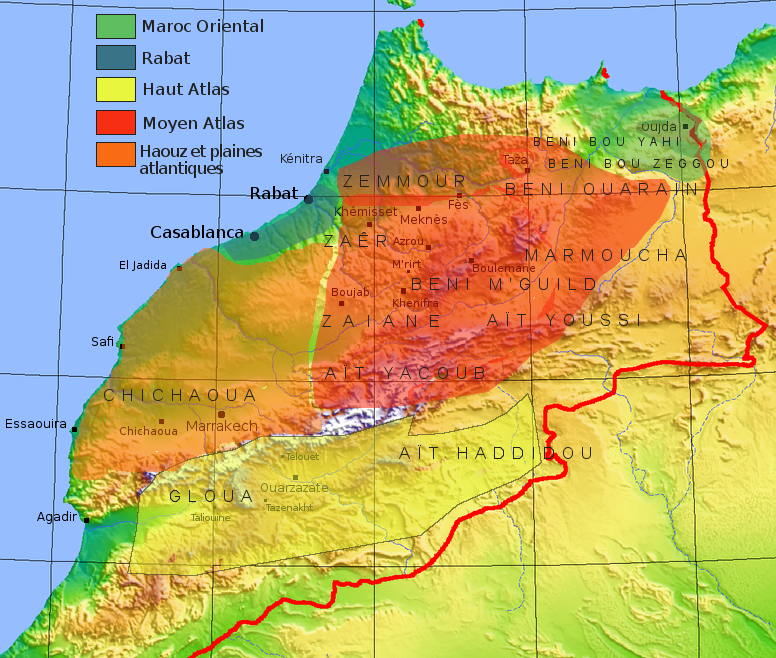 With the arrival of the Arab conquerors around 700, many independent kingdoms will be created in Morocco, followed by another large Berber dynasties. It was during this period that the nomads from Western Sahara caravan will settle in the south of Morocco, in Taroudannt, the capital of SOUS. The installation of French in Morocco dates back to 1844, and will be followed by Spanish. All these invasions will influence the Moroccan art, but little Berber art carpets. In his book "Berber carpets of Morocco: The symbolic, origins and meaning", Bruno Barbatti explains this curiosity by the isolation of the Berber's tribes of the Atlas and the Atlantic plains. Their geographical location placed them away from the great ancients civilizations and the Silk Road. Analyzing the decoration of Berber's carpet, Bruno Barbatti says that geometrics figures forms and patterns look like those that are dating from the European Paleolithic and the Oriental and Mediterranean Neolithic. Thus, Berber carpets Art appear as the last vestige of this lost world. Picture: Tribal Map of Morocco - Please, Click to enlarge. Each of those regions of Morocco has its own formal characteristics as well as specific methods of weaving. However, those 5 regions contain many Berber tribes, each using specific codes to decorate rugs. This geographical distinction is a bit approximative since it includes Zemmour rugs (confederation of Berber tribes) from the periphery of the Middle Atlas. Zemmour rugs , however, are considered as the most representative carpets of this area. 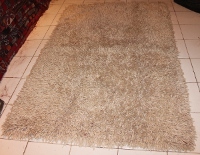 We must also mention Beni M'guild carpet, Zaiane carpet and Beni Ouarain Carpets. These carpets are characterized by thick carpet chunkier dimensions, instead of the High Atlas rugs long and narrow. Picture: Vintage berber Carpet, Zemmour, Morocco (Please, Click to enlarge). 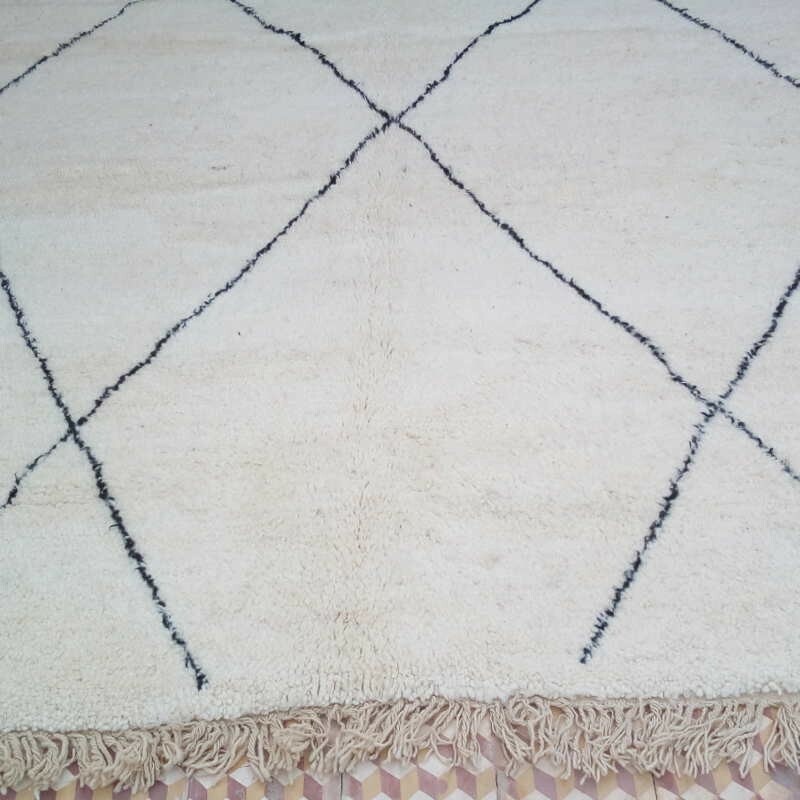 Quality wool of these rugs is remarkable, short (about 1 cm) as in Zemmour, Aït Yacoub, Aït Youssi, Beni Sadden tribes, or long in Zaiane, Beni M'guild or Beni Ouarain tribes. Indeed, in the Middle Atlas, Berber's carpets former served as protection against the cold. The quality of the wool was paramount. It was patiently harvested, and the making of a carpet could needs several years. Picture: Vintage Moroccan Carpet, Beni Ouarain, Morocco (Please, Click to enlarge). Red colors predominate in this region, with the exception of white carpets Beni Ouarain. The reds are never uniform, rather dark, and lie between the red backs red brick and terracotta. We often find harmonies red and gold. In the Aït Yacoub tribe, carpets are usually predominantly black, red and tan, with one or more frames surrounding the center diamond. Picture: Vintage Moroccan Carpet, Aït Yacoub, Morocco (Please, Click to enlarge). 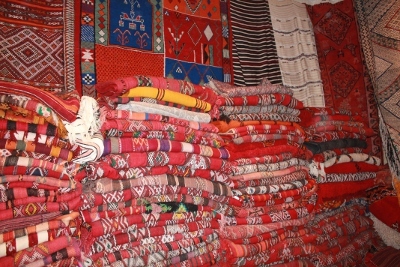 Very rare, Vintage Moroccan carpets in Morocco Oriental are made in the region of Oujda and Taourirt. These are large carpets with high and tight wool. The background color is usually dark red with decoration diamonds using blue and green colours. They are found in some museums and in some private collections. This region of the Moroccan High Atlas extends from south Marrakech to the first dunes of the Western Sahara. 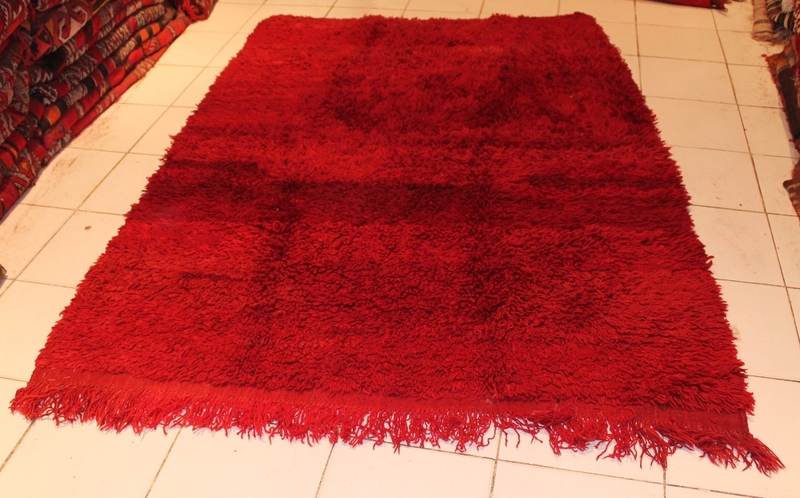 These rugs were made ​​by the great Berber's tribes Ouaouzguite, in the cities of Ouarzazate, Télouet, Taliouine or Tazenakht. Picture: Vintage Moroccan Carpets, Tazenakht, Morocco. 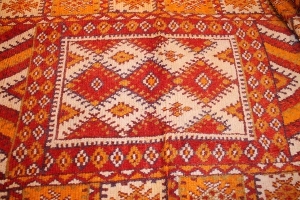 Here, the background color of High Atlas Berber carpets is often yellow-orange, red is no longer used for decoration. We can find diamonds inserted into a frame and chevron patterns. White isolate patterns and highlights it. Unlike carpets from the Middle Atlas, the Vintage Moroccan Carpet Ouaouzguite are elongated. Picture: Vintage Moroccan Carpet, Tazenakht, Morocco. (Please, Click to enlarge). 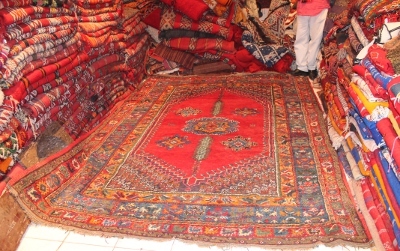 The carpet shown here measures 375 cm on 142 cm. Its orange dye is obtained from natural saffron. 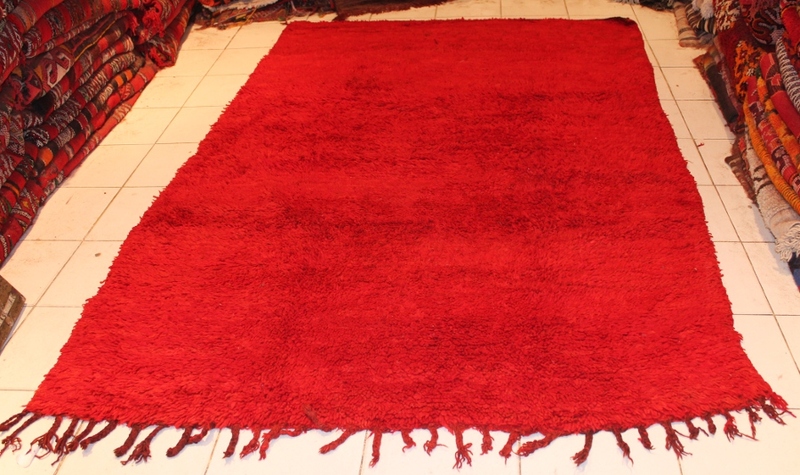 Moreover, dyes of ancient Berber's carpets are all made with plants or natural materials. That is why these dyes go through time without damage. The region of Haouz and the Plaines of Atlantic is situed in the South of Casablanca, covering Marrakech, Chichaoua, Essaouira and Agadir. This champaign gather carpets of différents Berber's tribes. 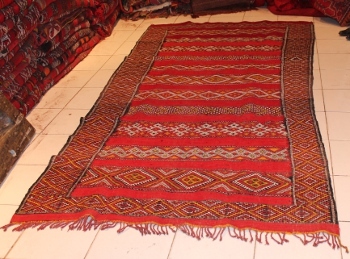 We can find there carpets from the Haouz of Marrakech, carpets from Oulad Bousbaa of Chichaoua, and carpets from the coastline whose those of Chiadma tribe. Picture: Vintage Moroccan Carpet, Chichaoua, Morocco (Please, Click to enlarge). 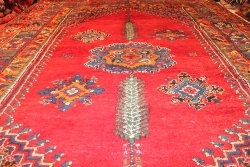 Antique Berber's Carpets of Chichaoua have a beautiful red "Rose madder". Picture: Vintage Moroccan Carpet, Chichaoua, Morocco. (Please, Click to enlarge). The paint "Rose madder" is extracted from the common madder plant (Rubia tinctorum). 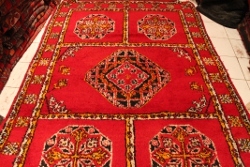 This typical knotted carpet Chichaoua enhances the interior with its bright red. With carpets of Rabat and Médiouna, we leave the world of tribal arts for the Arab-Muslim universality. Vintage Royal Carpet of Rabat reflects the wealth and opulence. They adorned the staterooms of town-houses. Picture: Vintage Moroccan Royal Carpet, Rabat, Morocco (Please, Click to enlarge). 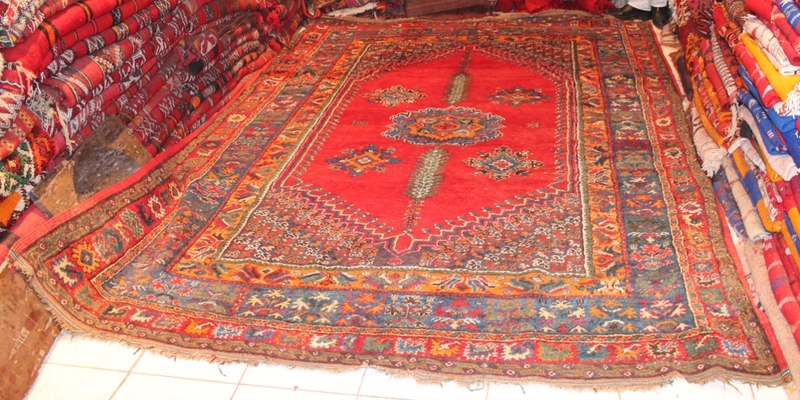 Antique Royal Carpet of Rabat have acclimatized to Morocco the art of oriental carpets. With this Antique Royal Carpet of Rabat, rectangular frames enclose a field with mihrabs and crenellated eight-pointed stars and spandrels. These carpets have also inherited frameworks filled with concentric patterns and widening towards the edges from Persia. Picture: Vintage Moroccan Royal Carpet, Rabat, Morocco. (Please, Click to enlarge).